Here are The Top Ten Most Popular Low-Carb Zucchini Recipes from Kalyn’s Kitchen just in case you’re lucky enough to get some zucchini left on your porch today! 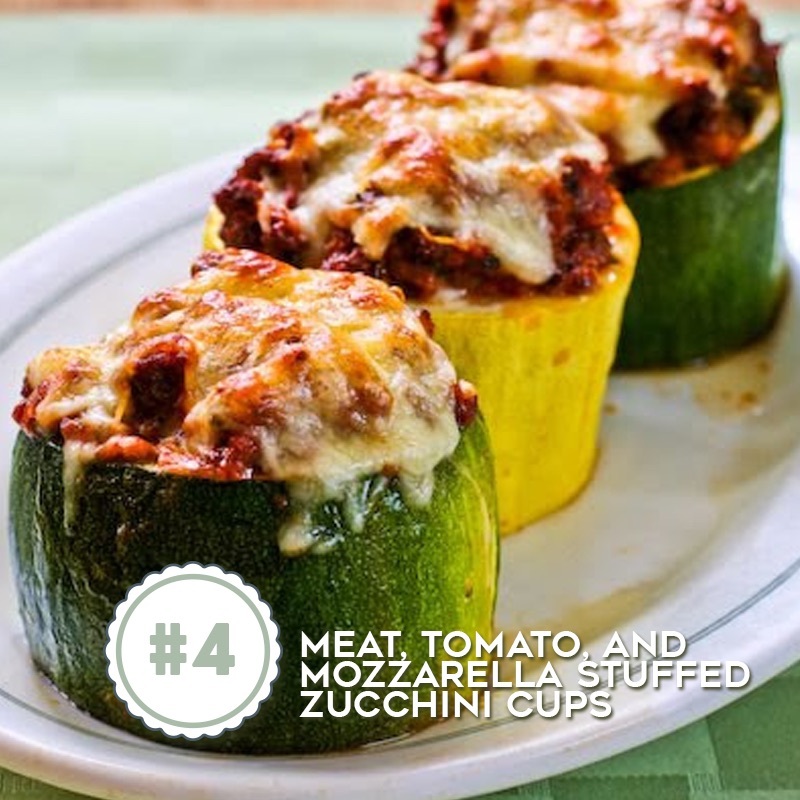 These tasty zucchini dishes are all low-carb, gluten-free, and South Beach Diet friendly. Use the Diet-Type Index to find more low-carb recipes like these. 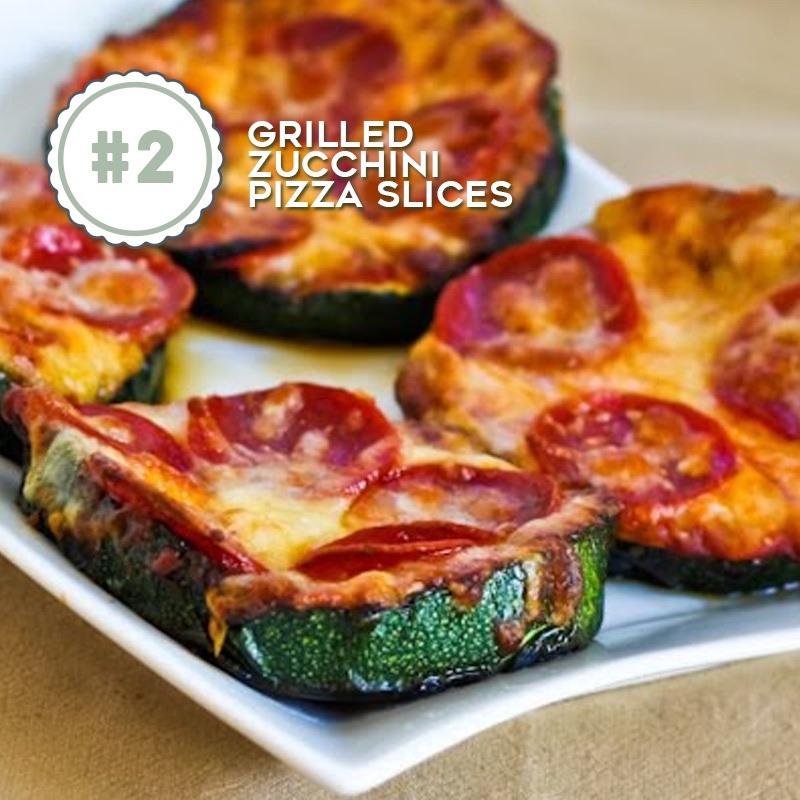 Click here to PIN The Top Ten Low-Carb Zucchini Recipes! Did you know August 8 is national Sneak Some Zucchini on to Your Neighbor’s Porch Day? This fun little holiday was started by a gardener who noticed how zucchini take over the world this time of year, and when I had a big vegetable garden, I used to go around the neighborhood and give them away every August! With the very small garden I have now, I planted my zucchini in the front flower bed this year where it’s not quite sunny enough. But the zucchini are still coming at a regular pace! For years I’ve celebrated this special zucchini day by updating my post with 50 Amazing Zucchini Recipes, and there are plenty of great recipes ideas using zucchini in that post. But last August I found myself wondering which ones were the most popular out of more than 100 zucchini recipes I’ve posted on the blog. And since zucchini is such a perfect low-carb food, I wanted to focus on the low-carb zucchini recipes. I poked around in the stats, and some of the recipes that made the top ten list were definitely a surprise. (Plus a few of my own personal favorites didn’t even make the cut!) But I ended up with a list of ten low-carb recipes that have all been hugely popular! And this year when I checked zucchini recipe stats again, these same ten are still the most popular and a few of them got new photos this year! If you’re a long time reader who likes zucchini, I’d love to know which of these is your personal favorite, or maybe you’ll find a new recipe in this collection of popular ones that you haven’t tried yet; enjoy! 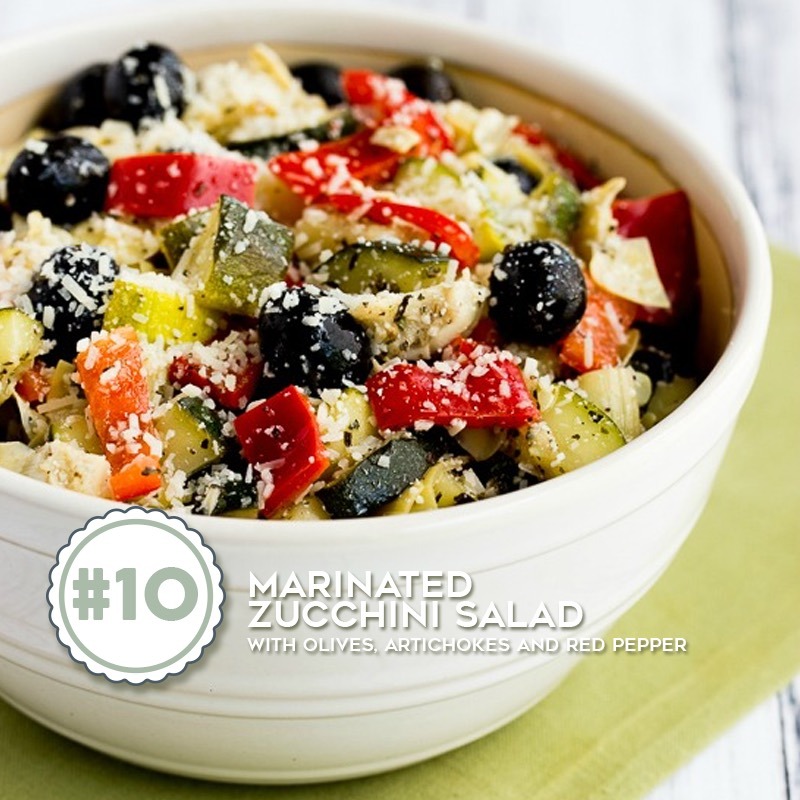 Low-Carb Zucchini Recipe #10 is this Marinated Zucchini Salad with Olives, Artichokes, and Red Pepper, and I updated the photos for this favorite salad recently which probably gave it the boost it needed to make it on the list! If you need an idea for a summer pot-luck this is a perfect salad that no one will guess is low in carbs! 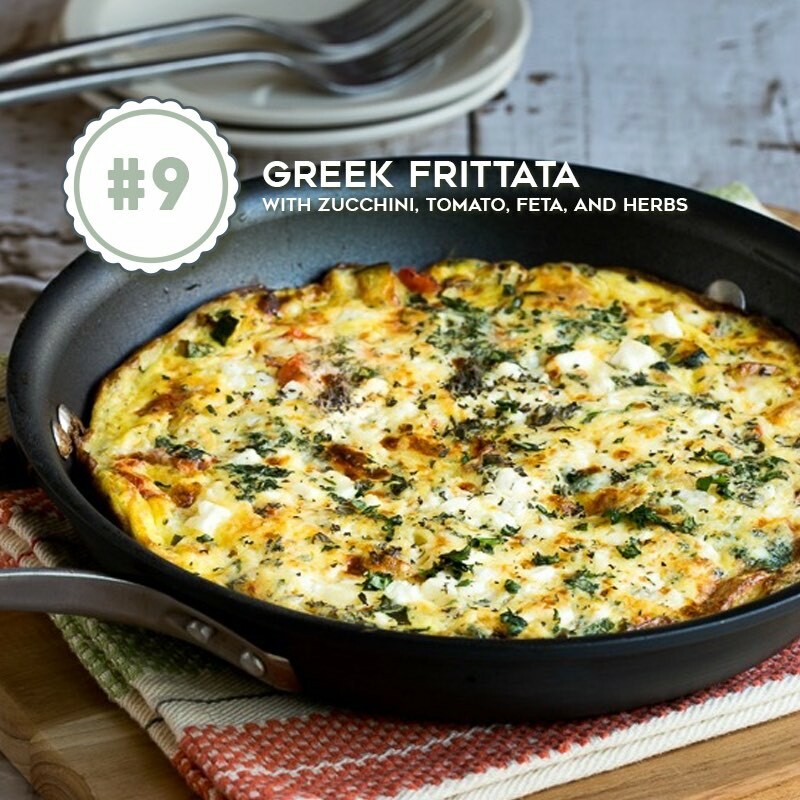 Low-Carb Zucchini Recipe #9 is this Greek Frittata with Zucchini, Tomato, Feta, and Herbs, and this is a personal favorite that I love to make on the weekends and reheat for breakfast for a few days! And if you have some Greek oregano in the garden, this recipe is a perfect way to use it. 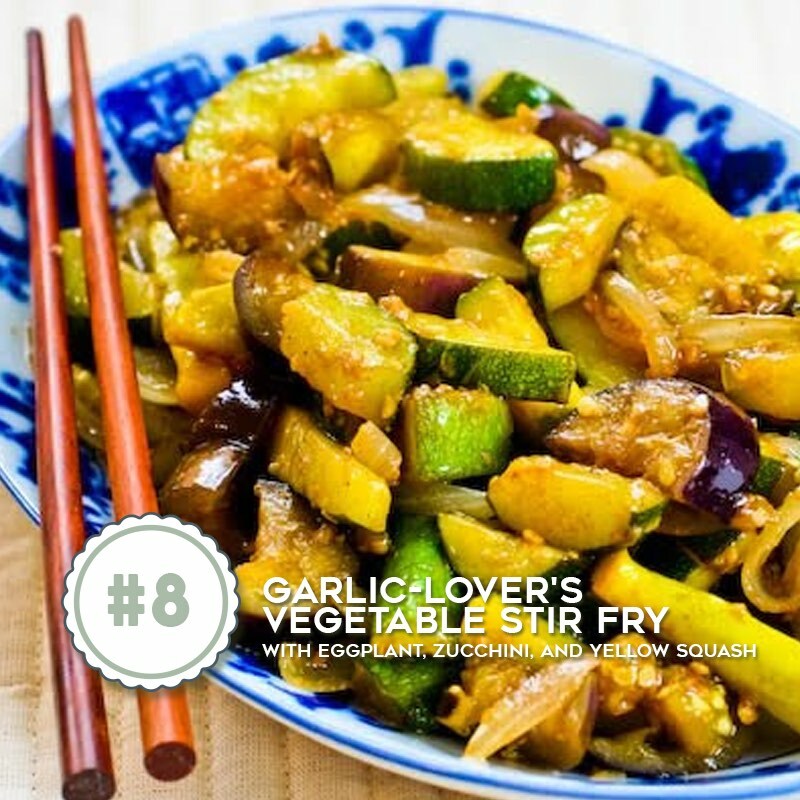 Low-Carb Zucchini Recipe #8 was definitely a surprise, although I’ve made this Garlic-Lover’s Vegetable Stir Fry with Eggplant, Zucchini, and Yellow Squash quite a few times and always enjoyed it so I shouldn’t be that surprised! Low-Carb Zucchini Recipe #7 is Parmesan Encrusted Zucchini, and of course the combination of parmesan + zucchini is always a winner, right! Low-Carb Zucchini Recipe #6 is this Zucchini Bake with Feta and Thyme that I’ve made pretty much every year since I first posted the recipe! This is another recipe where I’d love to shoot new photos, but don’t let that stop you from making it. I cook this in my toaster oven if it’s still too hot to use the oven. 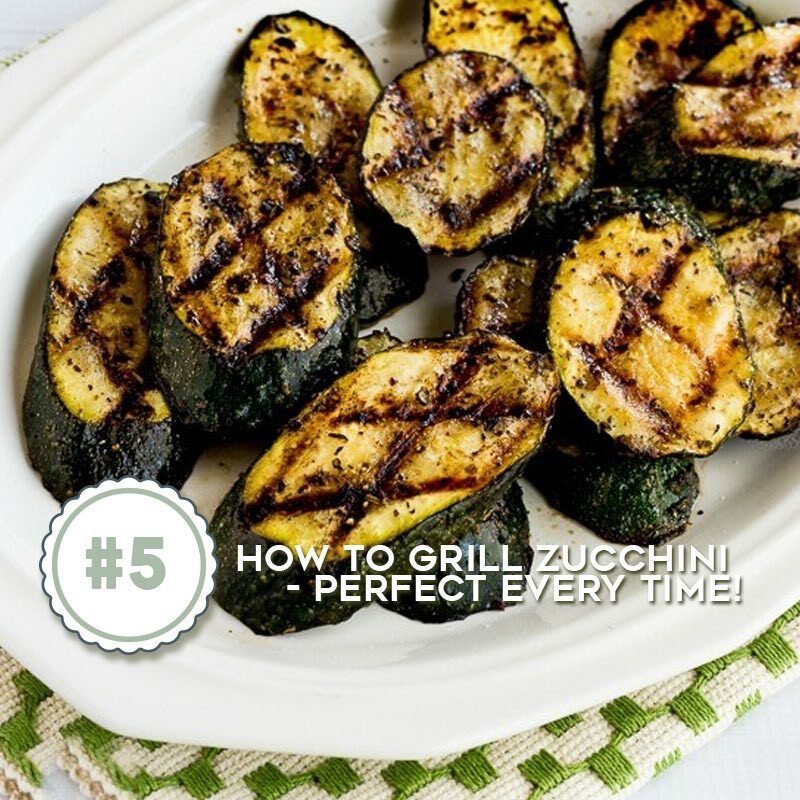 Low-Carb Zucchini Recipe #5 is this hugely popular post on How to Grill Zucchini – Perfect Every Time. I use this way of cooking zucchini all summer long, and only stop making it when my deck is covered with snow! 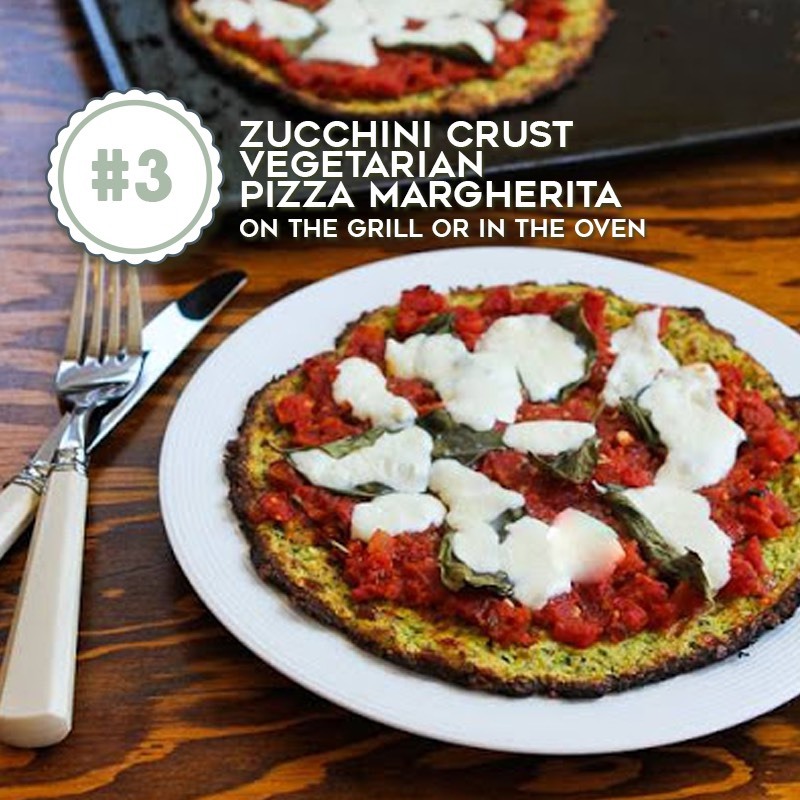 Low-Carb Zucchini Recipe #3 is this Zucchini Crust Vegetarian Pizza Margherita that you can make on the grill or in the oven. This one also surprised me a little, although this zucchini crust pizza is definitely delicious! Low-Carb Zucchini Recipe #2 is these Grilled Zucchini Pizza Slices, another fabulous way to use those monster zucchinis that you end up with if you don’t keep the zucchini picked! I can tell a lot of you want something low-carb that tastes like pizza because this favorite recipe has over 1.2 Million views! And the big winner in our countdown of Low-Carb Zucchini Recipes is this Easy Cheesy Zucchini Bake with over 4 Million views on the blog and well over a million pins. This year I finally got brave and updated the photos for this popular recipe! And it’s not hard to tell why this is popular, because doesn’t everyone love recipes that are easy + cheesy? What’s YOUR Favorite Low-Carb Zucchini Recipe? That’s our fun little countdown of popular low-carb zucchini recipes, and although I love all ten of these recipes shown here, I confess I was cheering for three personal favorites that I look forward to every year. Do you have a favorite zucchini recipe that also got overlooked? If so, I’d love to hear in the comments about what it is! Just tried your Cheesy Zucchini Bake today, April 29,2018. It was amazing!!!!! Even my husband commented it was the BEST casserole he’s ever had. Thanks. I will be trying more recipes. I am interested in the Low-carbs. Hi Ruth, so glad it was a hit! Hope you enjoy more of my recipes! How wonderful to have all these zucchini recipes in one place. I hope someone leaves zucchini on my doorstep on August 8!! Thanks Janice; I sure hope you get zucchini! I could use a zucchini donation myself this year! These all look absolutely delicious! Thanks for compiling them in one post. I'm going to print all of the recipes today. Thanks Lydia; hope you enjoy!